GREENSBORO, NC (July 24, 2018) – Mack Trucks today released the third episode of its RoadLife series, “New Blood,” on roadlife.tv and Amazon Prime Video. 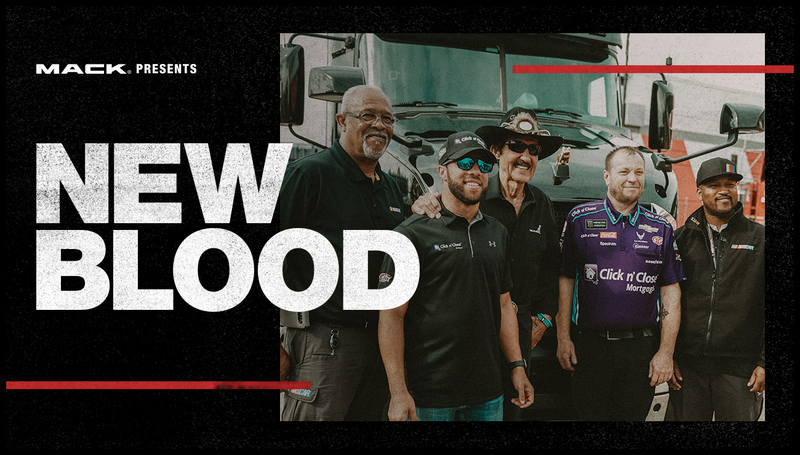 Featuring Bubba Wallace, the rookie driver for the iconic Richard Petty Motorsports 43 car, NASCAR Hall of Famer Richard Petty and veteran drivers who deliver the critical gear needed for each race, the episode focuses on the extreme coordination required to keep NASCAR racing. Tony Fripp, one of NASCAR’s hauler drivers, transports the television production equipment required to broadcast each of the 36 races during the season. He works closely with his colleagues to make sure everything is ready to go. Jeff “Cowboy” Icenhour drives the 43 team hauler from track to track, making sure the most important race equipment – the race car – is on time. It’s a responsibility he takes seriously. “New Blood” is available now on roadlife.tv and Amazon Prime Video. In addition, viewers can access RoadLife bonus content on Mack Trucks’ social channels: Facebook, Twitter, Instagram, LinkedIn and YouTube.